As I consider all that the Lord accomplished through His people in such a short time I am truly amazed. We are blessed with a beautiful facility that consists of the current sanctuary, a fellowship hall in the old sanctuary, educational facilities as they were in the former building, and an older fellowship hall that is currently used for Sunday school classes. I have often heard Fellowship described as "a country church in town." That is an accurate description. 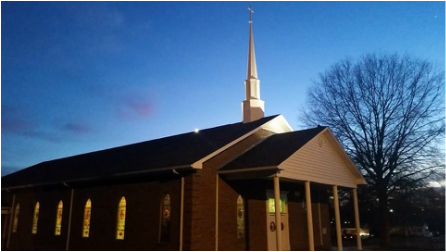 We are located in the heart of Mount Airy and yet there is a country charm about our church. We have folks from across the spectrum of employment and education, but all are at home here at Fellowship. We are a traditional church that seeks to place an emphasis on the preaching and teaching of the Word of God. We believe in making everyone feel welcome and intentionally go out of our way to show our gratitude and appreciation for all who attend our services. I am blessed to have the privilege of serving this fine church as pastor. The Lord sent us to Fellowship in the spring of 2010 and since that time He has blessed our efforts as we labor together for Him. I would like to take this opportunity to invite you to come and visit with us in any or all of our services. For those who visit Pulpit Pages from other areas, if you are ever in Mount Airy, we would love to have you come and visit us. I am sure that we will make you welcome and we hope that you will enjoy your visit. If you are not able to visit with us we would certainly appreciate your prayers. We are excited about what God is doing at Fellowship and are expecting even greater things in the days to come! Thank you for your interest in our church and taking the time to visit with us through Pulpit Pages.